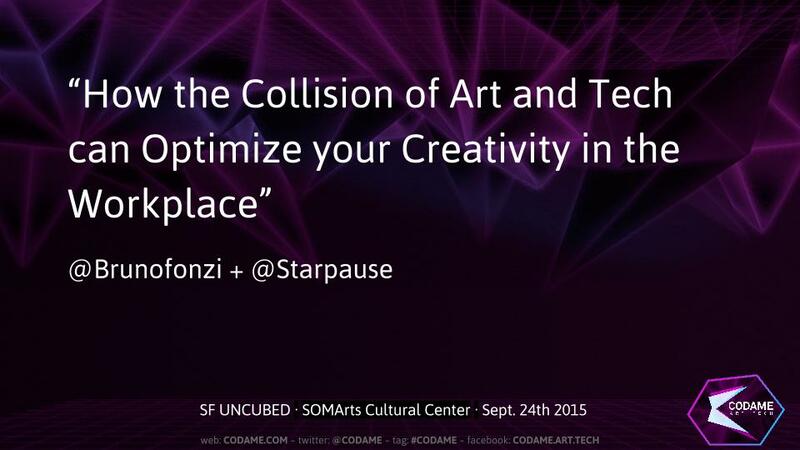 Join @BrunoFonzi + @StarPause for sf.uncubed.com/codame at SOMArts, Sept. 24th 2015 for an art+tech talk! On Thursday (9/24) we’re partnering with our friends over at Uncubed for their next event. SF Uncubed is a creative full-day gathering of hiring startups and SF’s top designers, programmers, engineers, & senior biz talent. Think startup showcase meets tech conference meets circus. Join the teams behind SF companies like GitHub, Evernote, FutureAdvisor, Credit Karma + more for a full-day of startup discovery & career-advancing classes taught by Founders, Engineers, Lead Designers & PMs pioneering the technology. Plus open bar, a live art showcase, music & more surprises throughout the day. Speakers include, CODAME co-founders Jordan Gray & Bruno Fonzi (co-leading a class: “How the Collision of Art and Tech can Optimize Your Creativity in the Workplace”), Founder/CEO of PredictSpring, CTO & SVP of Product at Recurly, VP of Science & Tech at PlaceIQ, & many more.